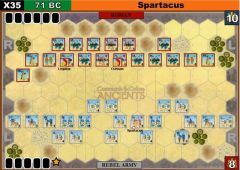 Spartacus was an able strategist, and he knew that his rag-tag army could not expect to defy Rome indefinitely. Spartacus planned to escape from Roman territory over the Alps, and headed north through Apulia. He divided his ever-growing army and placed his lieutenant, Crixus, a Gaul, in charge of a force of 30,000 German and Gallic slaves, while he maintained personal command of the remaining 40,000 fighters. 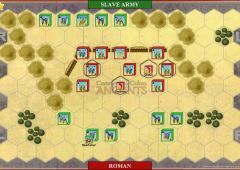 Crixus was over-confident after their many victories and allowed Spartacus to march far ahead while he allowed his men to continue their raiding and plundering. 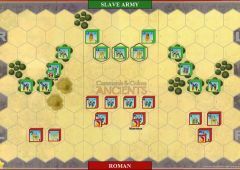 The consul Lucius Gellius Publicola came upon them suddenly and forced a battle. Crixus hastily formed his available men into a line of battle, but Publicola’s legionnaires cut them to pieces. Crixus was killed, along with two-thirds of his of his men. The survivors scattered and many probably re-joined Spartacus’s main column. 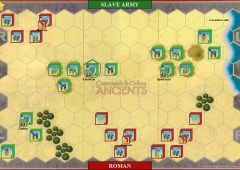 Two close games where the slave warriors rushed head first into the Roman center. 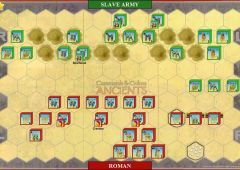 One game saw the slaves prevailing 6-4 whereas in the second game the Romans managed to bring over their medium units from the flanks to defeat the injured warrior units. 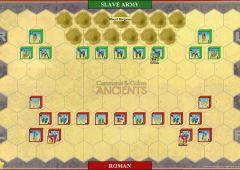 The second battle also saw the Roman player start out with rolling two flags with the heavy war machine against the unsupported warrior unit! 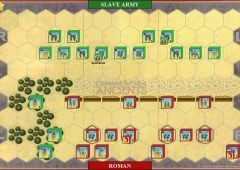 Not sure how to effectively use the light units on the flanks as slave player. Any ideas? Romans won 6-3. Played out as it looked. 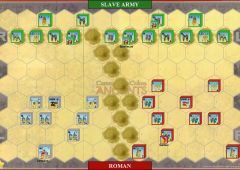 Curious took out Roman center, but Romans destroyed Slave right flank, and turned on slave warriors in center. 2 Roman leaders made the difference.